It’s already there… near the top of the thread. I sure do agree these were just tasting notes of a shake n vape sort. I guareentee these will be a whole bunch different after a few more weeks. I tried the Strawberries about 5 days later and they were actually weaker tasting. The rest of them seemed to be holding on just fine. I mix Max vg as well and can agree that it’s hard to get a full read on a flavor in that mix right off the bat. But I did put that in the tasting notes so take it for what it’s worth. I have plans to mix the INW lemon cake with the Birthday cake to see ! Mixed test batches of Sweet Potato, Elderberry and Cherry Blossom today. I’ll report in a week once they’ve had time to develop a bit. i received pina colada just a few days ago. i will mix some up and get it steeping and return with a review. Just mixed a stand alone 10% mix of Amoretti’s Pina Colada…the lick the spoon taste I got off of it was very very yummy! I cant wait to vape this!! 30 days to go!! Sweet Potato: Very creamy, realistic sweet potato notes. Mixed at 8% it’s not quite as concentrated as I would like, but it is very good. A sweet potato pie will be in the works if this steeps well at a week and picks up some strength when steeped. Bakery notes would need to be delicate in order to not overpower some of the more subtle earthy tones in the sweet potato. Very good standalone. Elderberry: A very nice sweet, and floral note. Mixed at 7% it’s slightly medicinal, but that’s normal of any Elderberry syrup that I’ve had in the past. Sweeter than juiced fresh Elderberries. Possibly a good addition to ice creams as a syrup flavor. Cherry Blossom: Holy earthy notes. Not as sweet as TFA Cherry Blossom, and somewhat reminiscient of TFA Black Tea. A bit harsh at 7%, but hopefully with a longer steep that will die down some. You can almost taste the dirt in it, but it’s surprisingly not bad despite those notes being present. Hasnt had much curing time tho but i have a feeling some of the secondary notes will need to be lowered based on first tasting. Is the sweet potato standing out alright at that percentage? On a finger taste test, yes. Im hoping it comes out a bit more as some of the others settle down. EDIT: I have to say i am very much enjoying the flavors i received. Ken I bet Cinnamon Custard RF/NWF ( whatever we’re calling them these days ) would be good in there if you swapped out the CDS. I have a couple more mixes written down using both Vanilla and Cinnamon Custard RF and one using Bread pudding as a replacement for CDS and CC RF. I hope you get better soon. Btw you said flu shots ( plural ? ) ah your going to start injecting those that come into contact with you ok just get your flu shot next year Well u knew it was coming from the nurse. Yea that’s the problem with the flu shot. This years flu shot was a crazy hybrid had 3 different types of Flu viruses in it from all over the world. I know 2 were China and Africa and I believe the 3rd one was the H1n1. After this post I was contacted by Terrence from Amoretti to test a few flavors. I’ve been following this thread and viewing their website. I was really hoping these would compete with MF since they say these are extracts… Highly concentrated extractions and essential oils Flavor chocolate, cheesecake, mousse, cake batter, ice cream, gelato and etc Cold pressed and virtually alcohol free Kosher Bake-proof and freeze-thaw-stable From the usage% and the notes they don’t sound any different than most vendors. He was kind enough to send a few flavors to test. I finger tested these today and I must say I’m impressed with how real these taste, but they don’t seem to be very concentrated… except the Ginger. It almost took my breathe away. The only real way to value a flavors worth is to mix it and vape it, so I’ll reserve judgement until these test are complete. Thanks Terrence for the opportunity. I agree on the concentration but dayum, they are good. I had hoped for low % mixers but they are in line with CAP/TFA %'s. Terence had mentioned that they are working on more concentrated mixes. Look forward to hearing your thoughts on the cookie dough and english toffee, i had my eye on those. I’ve become accustomed to mixing highly concentrated flavors, so this will be a test for me. I’ve been following the RF/NWF thread and I see they are taking the plunge into low % extracts… sounds like something I’d buy. I’m looking forward to reading those reviews. Honestly, outside of MF the RF flavorings are the best that i have used, judging from his current line the extracts will be incredible. 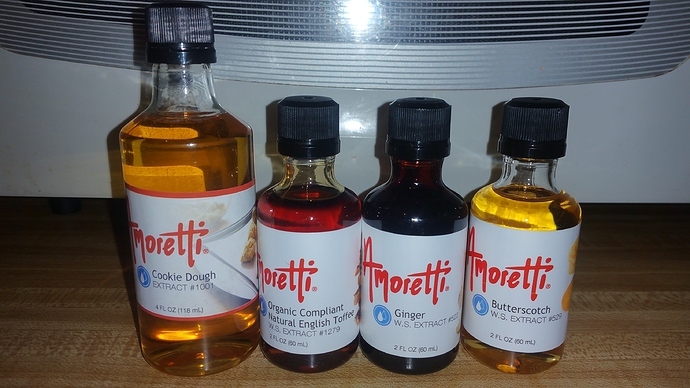 These Amoretti flavorings are pretty spot on as well. I could vape the Natural Birthday Cake, AKA 7-UP cake, by itself and have been since i mixed it with very little curing time. Wife went and bought me a 7-UP cake because i wouldnt shut up about it and i vaped, ate and compared, wow. I do have some plans for additions but for enhancement not for alteration, at least not yet.